If you find you've grown tired of endless spaghetti dinners at your fundraisers, you can change things up with an all-you-can-eat potato dinner next time around. As well as giving your group a change, it needs very little time and effort to prepare. 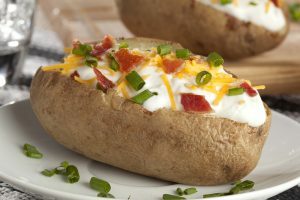 What you will need is enough baked potatoes and enough fillings to go in them: sour cream, chili, shredded and melted cheese, steamed broccoli, butter, chives, sautéed onions and mushrooms, bacon bits, ham, spices and hot peppers are all good ideas, but there's plenty of flexibility. You might want to set up a craft station to keep younger members of the group entertained. These stations could feature carved potato stamps, ink and paper. Sprout your own potato kits are another idea — you can make these using recycled glass jars, tooth picks, potato and growing instructions, and sell them at the event. Use flyers, signs and local newspaper adverts to get the word out and make sure you sell tickets in advance as well as on the door to catch as many people as possible. Those buying early could be offered a discount, and occasions such as this are great times to have a 50/50 raffle too. Thanks Justine, we’re glad you enjoyed it. How did the potato bar fundraiser go for you?